Oh do you know the pumpkin grandma? 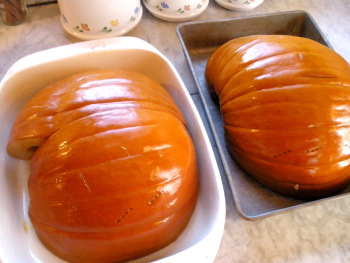 Last Saturday, I decided to make use of the pumpkins I purchased for carving, then never got around to carving. Bake. Baked! Scrape ... into a food processor. Process. Wonder if it's supposed to look like applesauce. Check the recipe ... Yes, it's supposed to look like applesauce. 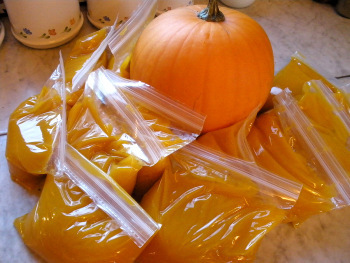 End up with a HUGE bowl of pumpkin puree. An amount equal to this many cans! Bag it ... and line up for the pumpkin can-can, Rockette style. "Take us to your leader!" Use one bag to make one of these. Yum! Use the innards to make these: Sweet-n-Salty Pumpkin Seeds.There you have it! That's how I spent 90 percent of my day last Saturday. But it was worth it. Thing is, that was two pumpkins. I have three more pumpkins to go! 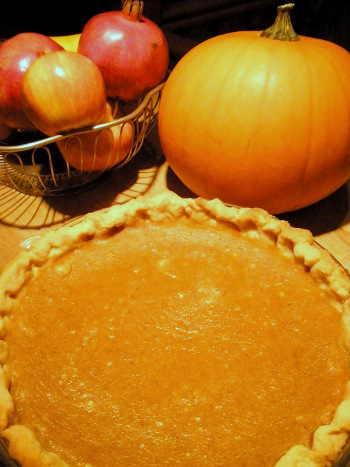 What's your favorite thing to make with pumpkin? Feel free to share the recipe.